Last Edit: 2 years 1 month ago by NoMansReshade. I'm a bit lost... you do know you can re-order shaders by simply dragging them around? For 3.x I'm guessing the preset ini file controls the order. Switching the bold line should be the order they get loaded in I'm guessing. EDIT: "Secure connection failed." Well there goes that draft. Anyways what I tried to write when that error popped up was that I don't think the ReShade config file would be helpful and it's either going to have to be done via the preset config or you'd need to change the ReShade .dll injector source code directly for how this is handled, that's way above my understanding though even if I occasionally poke around in the Github repository for the shader files (Looking to see if anything's been changed or added such as the recent updates to some effects.) and for the injector itself, probably going to be a while before 3.0.7 or whatever is released though with Crosire being busy with real life currently and the code is probably also pretty complex. EDIT: Ah something like a "pragma" in the shader file itself determining a load order. ReShade does support a few of these but I don't think there's a load order one? Anyways, guessing it might be easier to have it all in ReShade.fx or what the main shader file would be in say a custom shader suite rather than having it in each individual effect file, of course it would break if the user were to rename any of said effect files in that case. Last Edit: 2 years 1 month ago by JBeckman. 3) When you install Reshade to a new game, just copy game.ini and dxgi.ini across. Naturally, if the game is d3d9 and you use Reshade as a d3d9.dll for eg, you simply rename dxgi.ini to d3d9.ini. And finally, in your game.ini, you have your Techniques line -- this controls the load order. So simply set up a game with the defaults you like, and copy those files out ready to be installed in any game you play. Just use some common sense when you edit the paths. This is what I do and take it one step further -- the Texture and Shader search paths in dxgi.ini point to a single global directory. 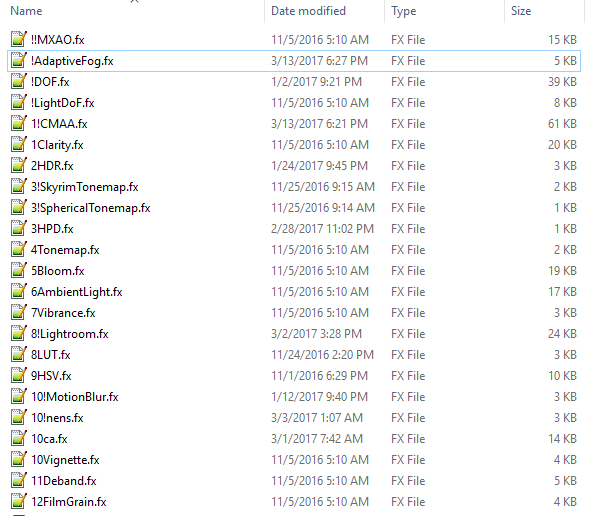 So I don't need to install shaders to each and every game, I simply copy Reshade and the above ini files to a game, and away I go. I have Reshade installed in some 30 games at the moment and just one Shader and Texture directory, which also makes it easy when it comes to adding new shaders or updating shaders. Last Edit: 2 years 1 month ago by Martigen. NoMansReshade hellow! thank you ! very love your custom shader suite,can you share it for me?